We have emerged as leading trader and supplier of premium quality High Strength Structural Nut that is typically used with large diameter and high strength bolts. Our offered nut is manufactured at vendors' end using superior grade raw material and advanced technology. In order to ensure the defect free supply at clients' end, the offered nut is stringently checked against several quality parameters by a team of quality experts. 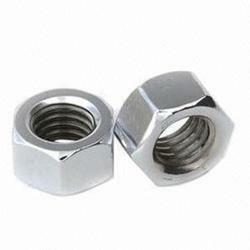 Besides this, we provide tis nut in various dimensions as per clients' demand. In Nagpur, Popular Tools & Hardware is an established business entity that has touched the apex of success in supply of High tensile, S.S, Brass, M.S Nuts Bolts(Allen bolts, Hex bolts, Allen Csk), Drill bits,SDS screws,Springs, Pop rivets, Aluminum rivets,Metal Screws,Machine Screws,Anchors and other fasteners and all kinds of tools. We are reckoned extensively as reliable business entity in the market. Our ethical business policies, customer centric approach and competence to fulfill the demands of the clients with precision form the backbone of the company. With our sincerity and hard work, we have garnered a long list of valuable clients in every nook and corner of the country. We have satisfied clients to the fullest and have won their trust. Our firm believes in nurturing cordial relations with the esteemed patrons, has played a key role in the unparalleled success of the company. We are authorized dealers of Unbrako, LPS, Addison, Patta, Landmark Fastener (HP Screws).